Here's our "Live CD", featuring the B-side recordings of our "Studio CD" DEVILS, FARMS & TRAINS. It's not a snapshot of the brightest moments during our musical career, but rather a testimonial to the raw guts & genesis of our musical journey together. When you're in a band from the Washington DC area, playing the Grog & Tankard is a right of passage. Not only did we play the Grog & Tankard every week for 18 months, we got paid for it! This is a truly amazing accomplishment when you consider that just about every band in town has a story to tell about playing the Grog, and it usually involves getting stiffed at the end of the night. Phil recorded this CD directly to mini-disk, mixed it at home, and mastered it during our studio sessions. Finally, we want to thank J.B. Beverley (track #1) and Bob & Andy from "Jack Could'nt Make It" (track #7) for making guest appearances at our shows and on this recording. 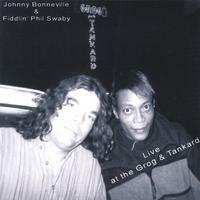 So sit back, give a listen, and come with us for a smokey night in a little bar in upper Georgetown called the Grog & Tankard.